We meet once a month (last Monday of the month) for some sketching, shopping of unique ingredients and eating of delicious lunch. 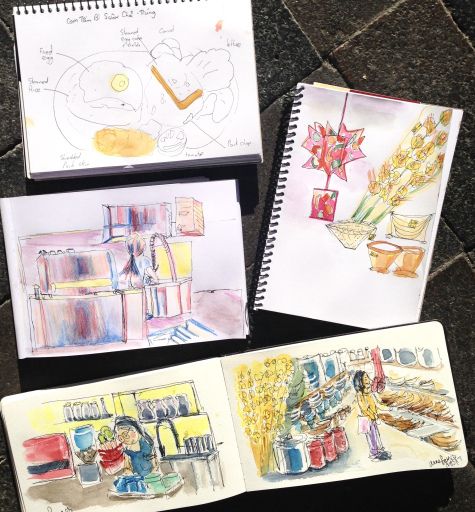 Our first ever Sketch&Lunch was all about Vietnam this month. 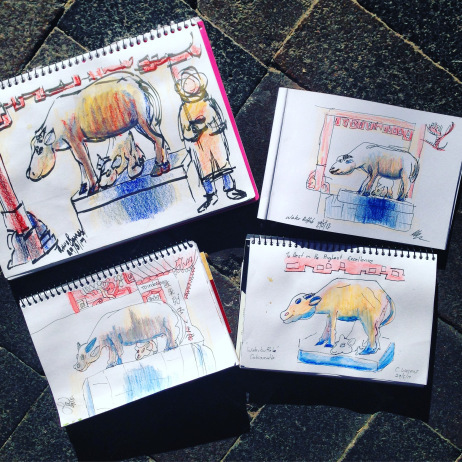 We met at the water buffalo and decided to sketch it whilst waiting for the rest of the group to join us. The water buffalo is on Freedom plaza in Cabramatta. 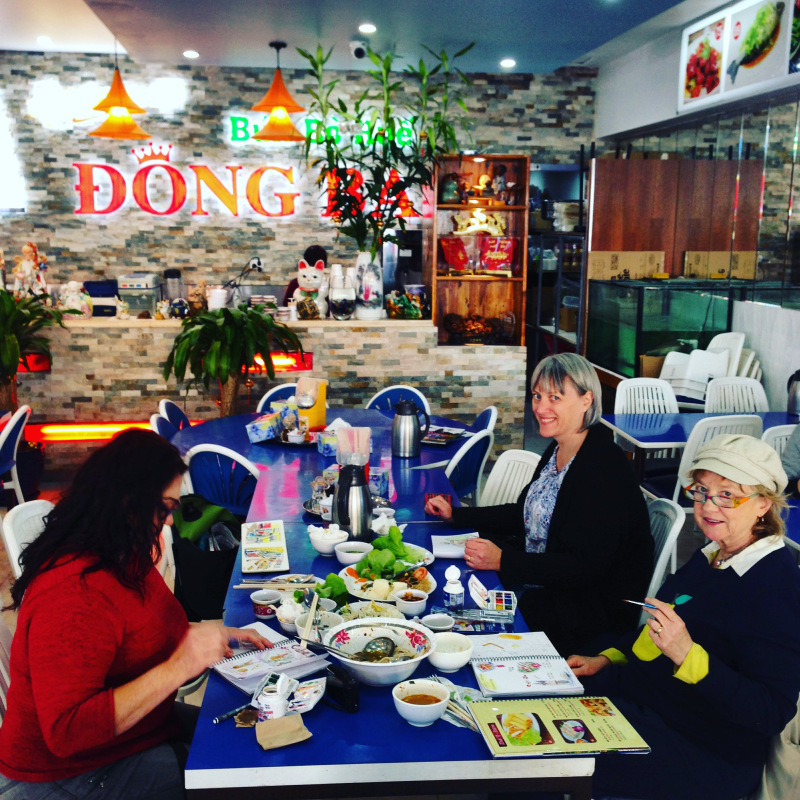 Next we headed to the Vietnamese bakery, where I introduced students to the delights of the Vietnamese donut, and a few basic skills in handling ourselves in a self serve bakery. Now what’s a donut, without a coffee. Straight to my favourite café in Cabramatta for a Ca phe sua da. A Vietnamese iced coffee. Here I gave a lesson on vignettes and creating a memoir of the day with a unique Vietnamese feel. What’s Vietnamese, what are the icons, the things that stand out, what’s unusual that you don’t usually see, how can you include that in your sketches? 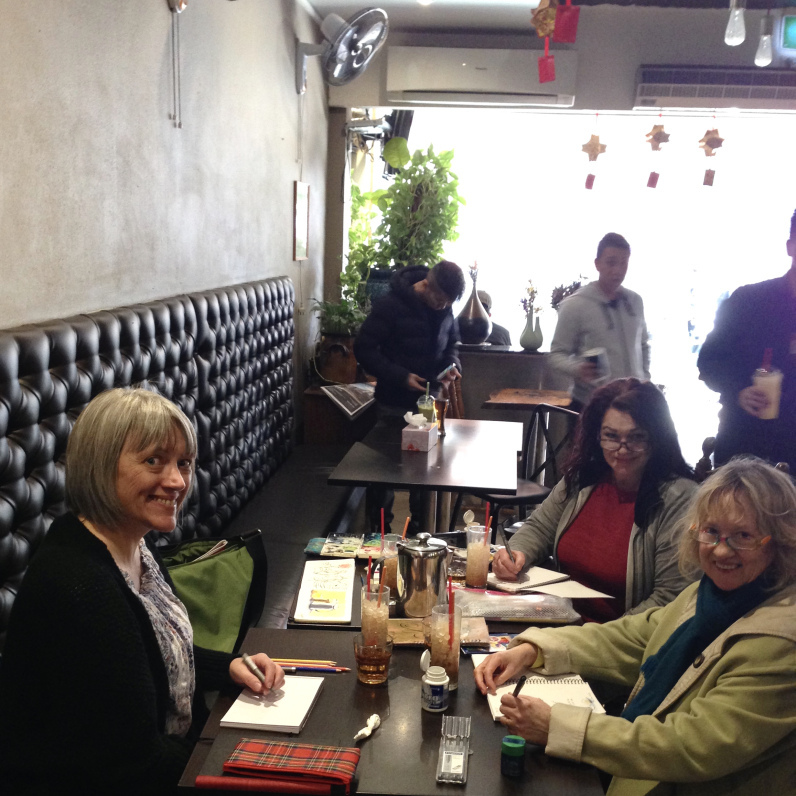 A bit of page planning, some sips of coffee, a taste of green tea, and we were off to pick up some essential supplies from the Vietnamese supermarket. I was able to help students find the things they have been having trouble finding, and also show them all the things that would make cooking Vietnamese dishes at home more authentic. Pho spices were popular, and I was sure to pick up my fresh rice noodles, loads of saw tooth coriander, perilla and rice paddy herb. YUM! So now we have had a chat to the locals, and wandered the aisles of the cooking equipment, its time for lunch! We settled on bun bo hue (spicy soup noodles), Vietnamese summer rolls, and the delicious workers streetfood dish of broken rice with marinated chargrilled pork, fried egg and pickles. We had to sketch fast, because we couldn’t wait to eat it all, and wasn’t it delicious. A few tips on how to draw food, how to make noodles look like noodles, and what to include and what to leave out. As always, Vietnamese food, never fails to please. Anecdotes of trips to Vietnam were discussed, and plenty of sketching was done, then it was time to pick up a few more supplies, tropical fruits, daikon radishes and yam beans, then home we went with gorgeous sketches in our sketch books, full bellies, and anticipation for the next Sketch&Lunch Day.